Assistant chef Michael Monteleone puts a finishing touch on cannabis-infused vegetable tarts. As more states legalize the use of recreational marijuana, the California chef is aiming to elevate haute cuisine to a new level. 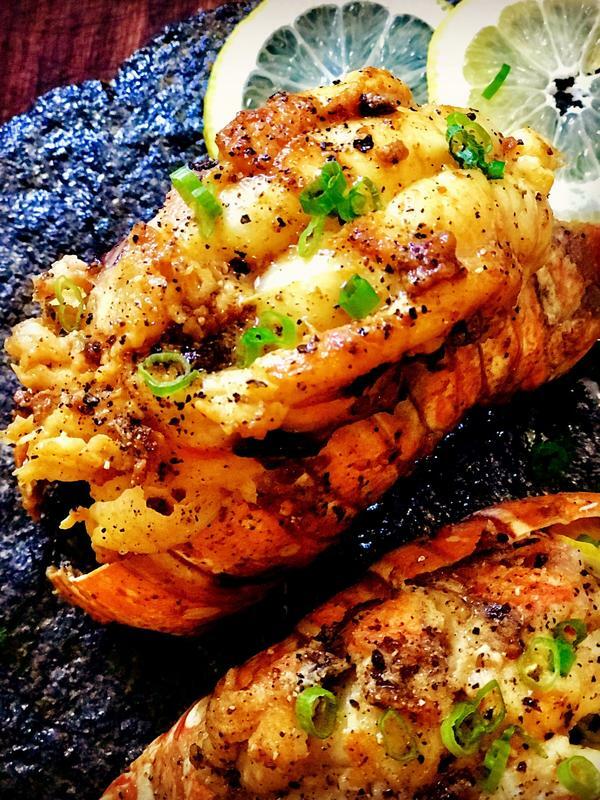 A lemon pepper lobster tail by Andrea Drummer, winner of Netflix's first episode of Cooking on High. Bong Appetit is coming out with a cookbook this fall. One of its contributors, co-host Vanessa Lavorato, owns Marigold Sweets, a "cannabis confiserie" in Los Angeles specializing in handmade, organic, pot-infused truffles. She says a challenge for chefs working with legal cannabis is the newfangled alchemy of dosing. "It's just to add a little bit of herb," Lavorato says. "It doesn't even need to get you high. It shouldn't overwhelm you." Laverato says the musky flavor long associated with weed was once thought to drown out other ingredients. But that's changed, thanks to new cultivation and processing techniques by all of the cannabis companies that have sprung up in the wake of legalization. "You don't have to taste anything if you don't want to," she says. "They have distillates. They have different concentrates that concentrate it down to THC or CBD." THC is the cannabis compound that can get users high. CBD is different. It's another cannabis compound that lacks psychoactive properties. Fans believe CBD relieves anxiety and pain, and it's become a popular ingredient in cocktails. One upscale restaurant in downtown Los Angeles has dedicated an entire menu to it. The pre-fixe "power lunch" at Spring features CBD in such dishes as English pea soup, branzino with piquillo and Espelette, and peach panna cotta. "It's like putting hemp seeds on a salad, which people do," says proprietor Yassmin Sarmadi. She says she and her husband, chef Tony Esnault, take CBD every day to feel more balanced and healthy. It's easier legally to serve gourmet food with CBD than THC. But state and local laws are changing so quickly, it's tricky to keep up. Pot-focused chefs have to grapple with everything from child-proof containers to where you can actually consume your fancy edibles. California chefs interested in creating Michelin-worthy pot restaurants have been hampered, for example, by regulations forbidding customers from buying and consuming cannabis in the same place. (There are a few exceptions.) But this year, West Hollywood is granting a few new licenses for cannabis consumption areas that might transform the city into a destination for upscale cannabis tourists. Imagine a high-end West Coast Amsterdam, says Vanessa Lavorato. "West Hollywood is saying you can do restaurants. You can do a spa. You can have a café," she says. "It's really going to be exciting to see who gets the licenses and what they do with these licenses." But those questions are politicized ones in a country that's incarcerated hundreds of thousands of people for marijuana-related crimes. Andrea Drummer is a private cannabis chef who has catered dinners for Hollywood stars, and created a room service CBD menu for the James Hotel in New York. She plans to one day open a fancy cannabis restaurant of her own. "I would love to employ people that have been pardoned or are coming out of jail for nonviolent marijuana crimes," she says. "I would love to be able to give people jobs, people that look like me, black and brown people that should have some part in this industry." Before working with cannabis, Drummer worked as an anti-drug prevention counselor for many years. She had a bad experience smoking pot as a young teenager and ended up having to do community service. As an adult, she attended Le Cordon Bleu College of Culinary Arts in Pasadena and found herself first interested in cannabis when she made pot brownies as a favor for a friend. And Drummer says cannabis relieved the pain she experienced after so many hours of working on her feet. Drummer won the first episode of the Netflix show Cooking on High with a cod cake sandwich. When I met her in Los Angeles, she made me a blue cheese salad with roasted pear dressing. Her dishes are based on cannabis-infused butters and oils that she makes from scratch. She enjoys working with the flavor profiles that come with different varieties of weed. "The notes you find in sour diesel are different from lemon haze, are different from OG Kush," she explains. Drummer thinks of weed as just different seasonings for a different kind of foodie. One who puts the "pharm" in farm to table. Here in California, some chefs are bringing together high-end cuisine with ingredients that might actually get you high. ABDULLAH SAEED: Cannabis-infused foie gras - we've come a long way from weed brownies, huh? TREVOR MILBERY: (Laughter) Yes, we have. GREENE: A long way, indeed. All right, this trend is the subject of a Viceland show called "Bong Appetit." You get that, right? 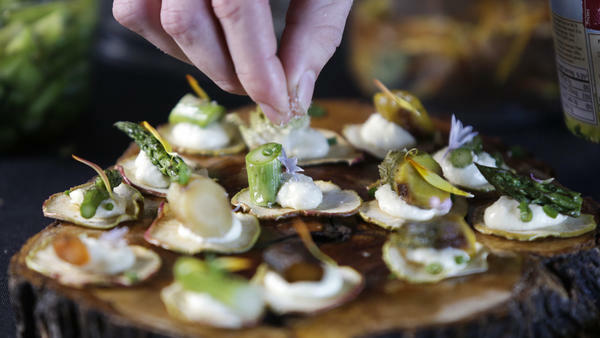 It's also been lucrative for some chefs in San Francisco and LA, as NPR's Neda Ulaby reports. NEDA ULABY, BYLINE: The biggest challenge for these chefs, they all say, is dosing. It's a new-fangled alchemy, adding just enough state-licensed weed to your sous vide pot roast. VANESSA LAVORATO: It's just to add a little bit of herb. It doesn't even need to get you high. It shouldn't overwhelm you. ULABY: That's Vanessa Lavorato. She owns a chocolate company in Los Angeles that sells handmade, organic, pot-infused truffles. She also co-hosts the show "Bong Appetit," making cherry chocolate ice cream with cannabis crumble. LAVORATO: We're going to sprinkle in some of the activated keef. ULABY: The show has been popular enough to inspire a cookbook coming out this fall. Lavorato says weed's musky flavor was once thought to overwhelm other ingredients. But that's changed thanks to new cultivation and processing techniques. LAVORATO: You don't have to taste anything if you don't want to. They have distillates. They have different concentrates that isolate it down to THC or CBD. UNIDENTIFIED PERSON: That's going to be your CBD English pea soup. ULABY: This upscale LA restaurant, filled with fountains and pepper trees, serves a prix fixe CBD menu. CBD is a cannabis product that does not get you high. The chef at Spring uses it in sweet corn risotto, branzino and poached peach panna cotta, says proprietor Yassmin Sarmadi. YASSMIN SARMADI: It's like putting hemp seeds on a salad, which people do. SARMADI: Forget about the cocktail; everybody's doing that. Let's do a menu with this. ULABY: It's easier, legally, to serve gourmet food with CBD than THC. That's the psychoactive stuff in cannabis that can get you high. State and local laws here change so quickly, it's tough for entrepreneurs to keep up. Chefs interested in creating Michelin-worthy cannabis restaurants have been hampered by regulations. In California, for example, you can't buy and consume cannabis in the same place, with a few exceptions. But this year, West Hollywood is granting a few new licenses for cannabis consumption areas that might transform the city into a destination for upscale cannabis tourists. Imagine a high-end West Coast Amsterdam, says Vanessa Lavorato. LAVORATO: But West Hollywood is saying you can do restaurants. You could do a spa. You could have a cafe. You know, it's really going to be exciting to see who gets these licenses and what they do with those licenses. ULABY: Politicized questions in a country that's incarcerated hundreds of thousands of people for marijuana-related crimes. Andrea Drummer is a private cannabis chef who's catered dinners for Hollywood stars and created room service CBD menus for a luxury hotel. She plans to one day open a fancy cannabis restaurant of her own. ANDREA DRUMMER: I would love to employ people that have been pardoned or coming out of jails for non-violent marijuana crimes. I would love to be able to give people jobs - you know, people that look like me, black and brown people that should have some part in this industry. JOSH LEYVA: Welcome to "Cooking On High," the first-ever competitive cannabis cooking show. ULABY: ...Which, in the first episode, she handily won. MOD SUN: Andrea's sandwich was the best [expletive] sandwich I've ever ate in my whole [expletive] life. ULABY: Right now Drummer is making a blue cheese salad with roasted pear dressing. Her dishes are based on cannabis-infused butters and oils she makes from scratch. Drummer enjoys working with the flavor profiles that can come with different varieties of weed. DRUMMER: The notes that you find in sour diesel that are different from lemon haze that are different from OG Kush. ULABY: Different seasonings for a different kind of foodie who puts the pharm - P-H-A-R-M - in pharm to table. Neda Ulaby, NPR News, Los Angeles. Transcript provided by NPR, Copyright NPR.